Landmark is set in spacious grounds and is a most striking property. To compliment the architecture, its furnishings are of the finest quality. It stands at the northern end of the exclusive Sandy Lane Beach, which offers excellent bathing, and commands a view of the entire bay. The house, built mostly of local coralstone, has a large open-plan living area and a separate dining pagoda. There are four luxury air-conditioned suites, three on the ground floor level and one on the first floor, each with twin beds and its own private bathroom and a view of the bay. 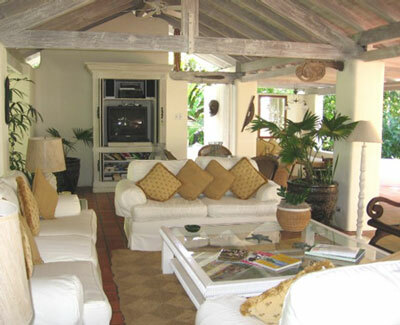 A unique two bedroom cottage is located on property just a 'stone's throw' from the exclusive Sandy Lane Beach. This attractive cottage has a distinct treehouse feeling, with the living and dining rooms on upstairs patios overlooking the attractively landscaped grounds of the complex. Both double bedrooms have ensuite bathrooms and are air-conditioned. Tennis is available nearby at the Sandy Lane Property Owners' courts and there is an excellent 18-hole golf course at Sandy Lane just next door. Landmark is a distinguished property and its popularity is easy to understand.